Five nevv PLAYES, VIZ. The ENGLISH MOOR, or The MOCK-MARRIAGE. The LOVE-SICK COURT, or The AMBITIOUS POLITIQUE. COVENT GARDEN Weeded. The NEVV ACADEMY, or The NEVV EXCHANGE. The QUEEN and CONCUBINE. LONDON, Printed for A. Crook at the Green Dragon in Saint Pauls Church-yard, and for H. Brome at the Gunn in Ivy-Lane, 1659. LONDON, Printed for Andrew Crook, at the Green Dragon in Saint Pauls Church-yard: And Henry Brome at the Gun in Ivy-lane. 1658. 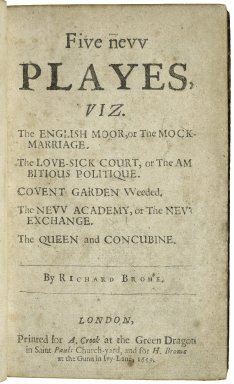 Published as part of Five New Plays, containing: The English Moor, or The Mock Marriage; The Lovesick Court, or The Ambitious Politic; The Weeding of the Covent Garden, or The Middlesex Justice of Peace (The Covent Garden Weeded); The New Academy, or The New Exchange; The Queen and Concubine. Title page imaged from Folger call number: B4872 copy 2. Image is not from the transcribed copy.